To get into the festive spirit of any special occasion, what best than opening a nice bottle of wine? 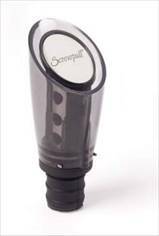 Rather than wait the many hours for your red to breath simply use Screwpull’s new Aerator to decant your wine. This easy to use accessory oxidises wine as you pour. The wine is optimally oxygenated on its way from bottle to glass, turning hours into seconds resulting in enhanced flavour and a smoother finish. The original and practical design includes a drip-free lip protecting your table clothes from any wine stains, as well as a stopper function to store and preserve your wine after opening. 5-Year Guarantee. Stopper: for easy storage, once wine is opened. When you finish using the aerator, remove pourer, turn the rubber seal at the bottom to close the pourer action and put the stopper back into the bottle.